Have a question about our custom sunrooms, in-home consultations, or simply want more information about all of the home improvement products that we offer? Take a look at the Frequently Asked Questions below to find answers to some common questions. 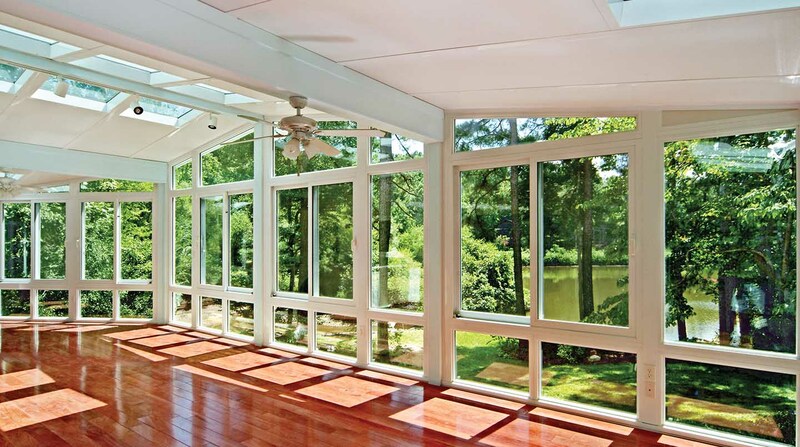 ​ How much do sunrooms cost? This is a common question, but a difficult one to answer. Because we custom manufacture each and every Patio Enclosures sunroom to your unique specifications, there isn't a one-size-fits-all price. Many factors determine the cost such as: foundation, where and how we would attach the room to your house, local building code requirements, and your design ideas. These are just a few of the variables that will determine the cost. To make this process simple and stress free, we offer a free, no obligation, in-home estimate. Call us today at 800-230-8301 and let us help you design the room of your dreams. ​ Can you enclose an existing porch/patio space or does the room have to be a complete addition? We can enclose an existing space or build a complete room addition. That is the beauty of our Patio Enclosures product lines. Since we are the manufacturer, everything we make is custom designed and custom manufactured for you and your home. You dream it and we will bring it to life! Whether you are interested in a complete sunroom or screen room addition, or simply want to enclose an existing space without sacrificing your view - we do it all. We accept cash, check, Visa, Master Card, American Express and Discover. Additionally, we have a number of financing options to assist you with your home improvement project. In most cases, we require a third of the payment at the time the contract is signed, a third at the time the materials are ordered and a final third at the completion of the project. However, ask your design consultant about your individual project. ​Why can't I get an estimate over the phone? Everything we do is 100% custom designed and custom manufactured for you and your home. Having one of our design consultants come to your home to assess your space, listen to your needs and recommend an ideal solution for your individual project is the best way to get the most accurate price. 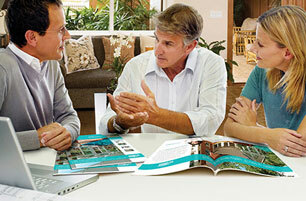 ​How long does an in-home consultation take? Consultation times vary. Our design consultants allow up to 2 hours for each appointment and that can vary depending on the scope of the project and the number of questions you may have. If your project is rather straight-forward, your consultation will likely take less time. ​Why should my spouse or significant other be at the consultation? Everything we do is custom manufactured and designed to your unique specifications. You choose everything from the color and design of your room to the type of glass and frame materials that are used. Having all decision makers involved in the consultation at the start of the project brings another point of view and opinion to such a large home improvement project. Additionally, the more details of your room that can be worked out in the consultation phase the better since this leads to a room that meets everyone's needs at a more accurate price. ​How long does it take to build my sunroom from signing the contract to completed installation? Eight to ten weeks is a normal estimation for a project. However, the timetable varies from project to project. Different municipalities have different waiting periods on permits. Our design consultants have a better understanding of the time it takes for a completed sunroom or solarium in your specific area. 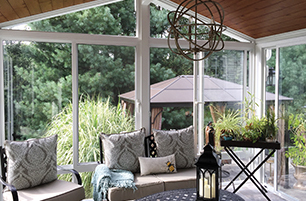 ​Can I use my sunroom all year round? 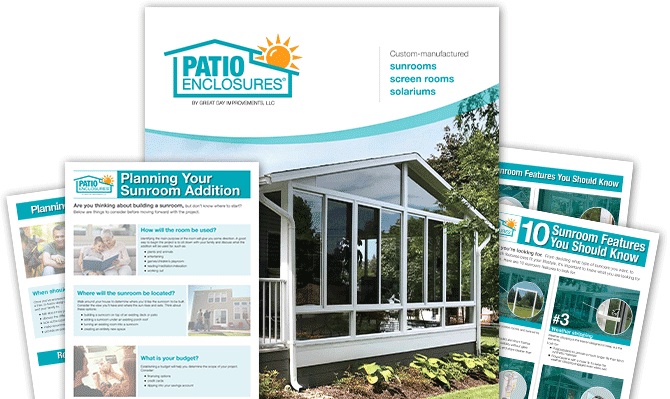 It depends on the type of room you choose and your geographical location but yes, Patio Enclosures manufactures several types of sunrooms which are designed to be heated and cooled throughout the year. 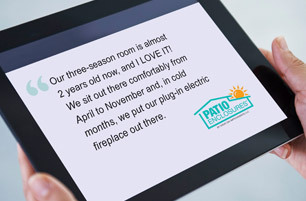 Our aluminum and vinyl all season (four season) rooms are designed with thermally engineered, energy-efficient frames, double-pane insulated glass and our Energy Star® rated 6" insulated roof to keep you comfortable all year long. Our solariums are also designed to be heated and air conditioned in accordance with local building codes. Your local design professional will discuss your options to help you make your dream a reality during the free, no obligation, in-home design consultation. ​Do I need to obtain a building permit for my sunroom? It truly depends on where you live. 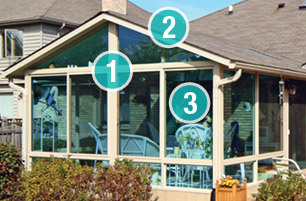 Patio Enclosures follows each city's local building codes. If your city requires a building permit, Patio Enclosures can assist in the process. ​Can I heat my sunroom with my home's existing furnace? Unfortunately, no you can not. We can, however, install a separate zone heating and air conditioning unit for you depending on the type of room you choose. ​Can I get shades or blinds with my sunroom or solarium? Yes! We sell custom shading systems that will help maintain the perfect indoor temperature for your new room. Ask your design consultant about the various styles and types that are available. ​In what type of room can I select double-pane insulated glass? Double-pane insulated glass can be selected in all of our sunrooms and comes standard in our all season (four season) sunrooms and solariums. ​Why should I use insulated glass? We recommend insulated glass if you would like to extend the seasons in your new sunroom. Insulated glass also helps improve the heating and cooling performance in your new addition. ​What are the benefits of tinted glass? Bronze Tint- Reduces glare and adds a warm hue to your view. It also reduces visible light and solar heat gain for your added comfort. Bronze tint also helps to reduce the damaging effects of UV rays on furniture and fabric. ​What is the insulating factor in your roofs? Our Superfoam roof system is manufactured in two thicknesses; a 3" and a 6". The 3" roof has an R-value close to R-15. Whereas the 6" roof has an R-value close to R-30. ​What kind of warranty does my sunroom come with? We confidently offer a lifetime limited warranty on all our sunrooms, solariums and screen rooms covering all manufactured products including glass, roof panels, framing, sealing and more. Ask your design consultant for more information.